“The Rev. Gerard Dunne has worked for 12 years essentially as a human-resources recruiter — albeit one in a habit cinched with a dangling wooden rosary — for the ancient order of the Dominican friars. Once, his medieval robes may have deterred some. But today he is convinced that the garment is his greatest selling point for enlisting new priests. 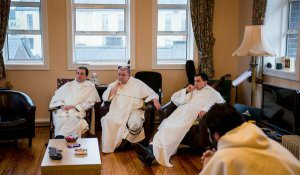 Read the complete article from the New York Times about the Dominican Friars here.